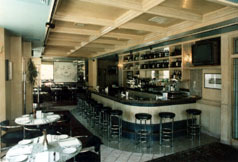 Cell phones ringing, diners dressed head-to-toe in black, and the occasional celebrity sighting have been de rigueur at Ciao Bella for years. The dining room, like the clientele, is casual chic---airy by day, mood-lit by night; the same goes for the ever-packed patio. Besides a blockbuster selection of vino and a pricey veal chop, Ciao Bella makes its mark with home-style Italian fare---veal Parmigiana, penne bolognese, fettuccine Alfredo, beef carpaccio. Execution is hit-or-miss, but the scene is sure-fire.